You are here: Home » MEDIA » Books » Thunderbirds: The Comic Collection Volume 2 written by Alan Fennell and art by Frank Bellamy (graphic novel review). Thunderbirds: The Comic Collection Volume 2 written by Alan Fennell and art by Frank Bellamy (graphic novel review). ‘Thunderbirds: The Comic Collection Volume 2’ contains the first twelve stories as written by Alan Fennell and illustrated by Frank Bellamy for TV21 comic back in the 1966-67. Although Egmont have reprinted some of these stories before, they have not done then all or in sequence. Considering the subject matters of politics, espionage and even terrorists shown in these stories which was quite adult back then and even more relevant today as we see and understand the real consequences of them. As such, there is something here for all ages. Although I’ve talked about these stories before, let’s hit on a few imperfections that I even noted back in 1966 with the first story. Penelope is introduced to the Tracy brothers where Jeff informs her that Gordon is doing some work on Thunderbird 4, despite the fact that he is sitting in the lounge and it looks like either writer Fennell or Bellamy made a mistake. More so, at the end of the page, Bellamy shows he knows how to draw John Tracy. Mind you, later in the story, having shown Alan returning to Earth in Thunderbird 3, at the end of the story both he and John are in Thunderbird 5 with no hint of TB3 in sight. ‘The Talons Of The Eagle’ shows International Rescue in a proactive role in capturing a new USAF jet’s radar jammer that they can’t detect so they can learn its secrets. What is important about this story is it shows the protocols not shown on television of checking for aircraft in the vicinity when returning to Tracy Island. On top of that, this is the story which introduced Mateo Island as International Rescue’s engineering depot. Strangely, it isn’t used in the later, ‘Tracy Island Exposed’, to hide the Thunderbirds when the Hood attacks the island. 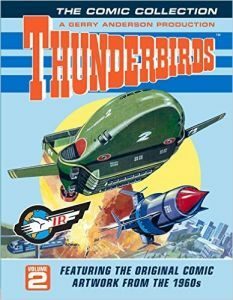 Instead, all three Thunderbirds are linked to Thunderbird 5 and something which is developed in the next story. ‘Solar Danger’ actually stays within things we expected to happen in space back in the 1960s when solar flares from the sun is spewing out matter to create another planet. International Rescue, realising the danger, gets the co-operation of the World President, to provide them with a missile powerful enough to stop that happening that Thunderbird 3 can take to the sun. This missile comes from Space City and we briefly meet Commander Zero, although whether he’s the same leader of the World Space Patrol is unknown. Anyway, the story after that point gets a little silly when Thunderbird 3 is marooned on an inhabited Venus and Thunderbirds 1 and 2 are adapted for space travel and sent to rescue them. Even though they are stretching things a bit and that at the time no one knew was Venus was like, considering the time it takes to get there, I didn’t fancy Alan and Brains’ chance of survival while waiting for them to arrive as neither are as fast as TB3. Thankfully, they didn’t do that again. There is going to be some déjà vu with ‘The Big Freeze’ story where part 3 is repeated as part 6 so you don’t see how Thunderbird 2 rescues Thunderbird 1 from freezing up. Fortunately, I had a different earlier book with the strip in to compare and have had a word with Egmont about it. The pages you miss shows how TB2 stops TB1 freezing in the blizzard. What is interesting seeing these stories in order is that it shows Bellamy’s strength in panel layout and his expertise in drawing transport, even outside of the Thunderbirds themselves, is equalled by his ability to draw animals. I’ve often mentioned gravitas in other reviews where you can believe something has the mass attributed to size. Bellamy always understood this and it reflects throughout. Thunderbird 2 is always awesome. Undoubtedly, your sprogs of today are going to be enamoured by the current ‘Thunderbirds Are Go’ series, but show them this book and I think it will reignite their interest in the original series as well. « X-Men: Apocalypse (first trailer).